Why Tom Perez and Terry McAuliffe have so much riding on Virginia's Nov. 7 gubernatorial election between Ralph Northam and Ed Gillespie. WASHINGTON — Some of those with the most riding on Virginia's governor race aren't even on the ballot. Tom Perez, the Democratic National Committee chairman, has been fending off donors and DNC members who are jittery over the party's weak fundraising and lack of wins in the Trump era. Just wait until Virginia, Perez has told them. The party leader, who was installed in February, sees the race as so important that the cash-strapped DNC has poured $1.5 million into the contest to date and plans to dispatch virtually its entire Washington headquarters staff to nearby Virginia by Election Day on Nov. 7. Now, with less than two weeks to go before voters pick between Democratic Lt. Gov. Ralph Northam and Republican Ed Gillespie in a close race, Perez and others in the party have to prove they can execute a winning strategy — or they will face a chorus of criticism. "We need a win," said Democratic strategist Chris Kofinis, who predicted Northam would prevail. "If we lose, there will be a lot of concern that the Democratic Party is rudderless in the sea of chaos that is the Trump presidency." The DNC doesn't typically invest in gubernatorial races, and the Democratic Governors Association is still the far bigger player in this race. That makes Virginia a test of Perez's ambitious strategy to retool the DNC for competition everywhere, all the time — including in elections this year in Alabama and New Jersey — and it comes at a time of ongoing friction inside the party. But Perez isn't alone among top party figures who are counting on Virginia for a personal boost. The state's governor, Terry McAuliffe, may be hoping to use a Northam victory to help pave the way for his own run for president in 2020. 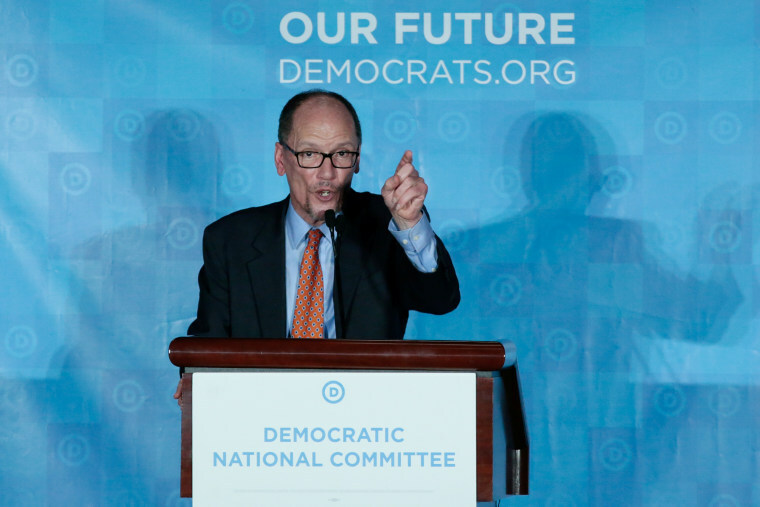 "It would be a blow to both Perez and McAuliffe if we did not win," said Ray Buckley, the New Hampshire Democratic Party chair and longtime DNC member who has clashed with Perez at times. Democrats have chosen friendly turf on which to make a big stand. Virginia is a competitive state, but one Democrats should win, and recent polls give Northam a single-digit edge. They hold the governor's office and both Senate seats, they’ve won Virginia in the last three presidential elections, and it tends to elect governors from the party out of power in the White House. And yet, with two weeks left to go, there's a fear among some Democratic leaders. The party's nominee is less than thrilling. Democrats are still divided in the aftermath of the Bernie Sanders-Hillary Clinton presidential primary last year. And Republicans perform better in off-year elections. To top it off, recent polls have been all over the place, with Northam leading Gillespie by as much as 14 points in one poll and trailing by a single point in another. Democratic operatives say they're confident that Northam will pull it out. But, after a series of relatively narrow special election losses this year, the political class is closely watching the first fair fight since Trump's election last November. The anxiety is acute enough that McAuliffe has told confidants his reputation is on the line. Any presidential aspirations he harbors would surely be damaged if Northam — his hand-picked candidate — doesn’t prevail. "What will hurt him is if he doesn’t pass the baton to a Democrat," said one longtime Virginia Democratic operative. On the other hand, the operative said, "if we win this thing, it's going to be a big deal for him." McAuliffe has helped put over $1 million into the race and knows his legacy is on the line. "It's critical for us to keep that governor's mansion," McAuliffe said in an interview with NBC News earlier this year. "If we don't have a Democrat in the governor's office in Virginia, all the things that we have done...they're going to roll those back." And a loss has the potential to kickstart another round of Sanders-Clinton camp feuding. Our Revolution, which grew out of Sanders' presidential campaign, decided to sit out the Virginia governor's race, irking some Democrats involved in the contest who worry about progressives staying home on Election Day because their favored candidate, former Rep. Tom Perriello, lost the primary. "As for Northam, our local groups make recommendations to the national organization for endorsements and his name was not recommended," said Our Revolution spokesperson Diane May, noting the group has endorsed state legislature candidates and will work to turn out voters on Nov. 7. Meanwhile, the outcome could influence the way tens of millions of dollars of liberal money is spent in the future. A slew of deep-pocketed outside groups that typically work on their own, including Priorities USA, the League of Conservation Voters and Planned Parenthood's political arm, experimented with pooling their resources for a $2 million digital campaign that could be a model for the future. And all the fretting has led some Democrats to worry that worrying is the party's bigger problem. "We can't continue to angst existentially over every single race," said Colm O'Comartun, the former executive director of the Democratic Governors Association.